from De Re Metallica, 1556, by Agricola (Georg Bauer). In Discorso, one of the last manuscripts written by Antonio Neri before his death, he reveals several transmutation recipes. One describes turning iron into copper; it is instructive because it uses common materials that we can identify and because the chemistry is now well understood. Take some iron sheets and lay them in vitriol water, being immersed in that, they will rust. Scrape off this rust, which will be a red powder, melt it in a crucible, and you will have perfect copper. The same effect can be had from various waters that are naturally vitriolated, because they flow through mines of vitriol, such as those of a source some distance from Leiden, and another below the fortress of Smolnik, [now in Slovakia]. Some estimate and not without reason, that this experiment, being used to prove the transmutation of metals, is not suitable for this purpose. 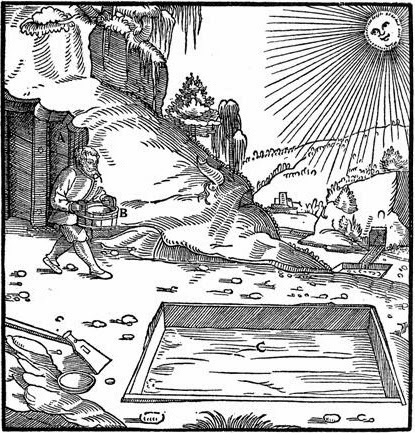 They say that the vitriolated waters become such because they are already heavy with the corrosive spirits of sulfur, having passed through the copper or iron mine, these waters corrode copper in the same way aqua fortis corrodes silver. So that really the substance of the copper remains in the water, which attacks the surface of the iron, which always remains iron. However, if that were true then the iron would not get consumed, or if it were consumed it would mix with the substance of the corroded copper in the water, and if it were fused, it would remain a mixture of iron and copper. And yet in this experiment, all the iron is consumed; it is reduced by the vitriolated water into powder, […] which in the fusion is still pure copper, so there should remain no doubt that this is a true transmutation. Given the state of chemistry at the time, Neri's reasoning is clear and rational. The iron disappears and a copper coating materializes in its place. What better evidence of transmutation could one ask for? The key to what was actually happening is in the criticism leveled by skeptics. It turns out that they were on the right track, but neither they nor Neri had the full picture. Today, we understand it as a simple ion exchange reaction; blue vitriol water is a transparent saturated solution of copper sulfate (CuSO4), in the presence of solid iron, the liquid dissolves the iron; copper from the vitriol is deposited in its place. The two metals, copper and iron, change places: the iron dissolves, forming green vitriol (FeSO4) and copper is expelled from the solution. The result is a reduction in the amount of the iron, which is replaced by a proportional deposit of pure copper. On a physical level, this chemical reaction is no different today than it was in the seventeenth century. What has changed is our interpretation of the experiment. What Neri viewed as a transformation of iron into copper, we now see as an exchange. There is, however, a deeper lesson in all this. As an alchemist, Antonio Neri was not being delusional or dishonest; he was careful, observant and applied his knowledge as best he could. This is no different from the way science works today. Both then and now, to be successful in unraveling nature’s secrets, one must become accustomed to a very uncomfortable situation: In the past, careful reasoning by brilliant thinkers has led to utterly wrong conclusions. The fact that much of our world is a mystery is unsettling; that the very process we use to understand it can be so flawed is harder to accept. Even more difficult is that the faculty we all rely on for survival—our own wits—can lead us so far astray. For more, see Discorso sopra la Chimica: The Paracelsian Philosophy of Antonio Neri”, M.G. Grazzini / Nuncius 27 (2012). This post first appeared here on 31 January 2014.